This is one of our debut combo sets, featuring a 3mm rope chain, and iced out Ankh Cross, together to create a great look! The ankh, also known as "crux ansata" is an ancient Egyptian hieroglyphic ideograph symbolizing "life". 1 x Ankh Pendant Necklace. Pendant Specifications. Chain Specifications. 4" (10.2cm). OVERALL HEIGHT 3.7" (9.3cm). Along With A Nice Iced Out Shiny Pendant Piece To Match The Chain. Pendant Specifications. 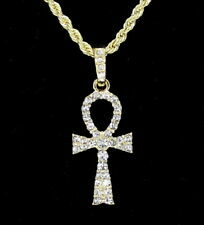 14k Gold Plated ANKH Iced Out 1" by 3/4in Pendant with 24" Rope Chain Necklace. Hieroglyphics Ankh Pendant. CHAIN WIDTH: 4mm. You will receive 1 Pendant & 1 Chain. CHAIN: 24" LENGTH. L2JK HIP-HOP JEWELRY. We will do our best to resolve your issue. 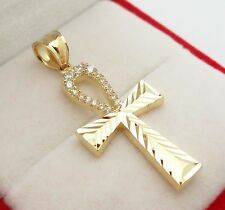 BeautifulNew Solid 10K Yellow Gold Egyptian Ankh Cross Religious Charm Pendant. 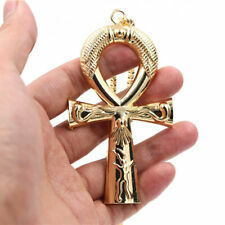 Design - Egyptian Ankh Cross. Country of Manufacture - Italy. Gift box included. 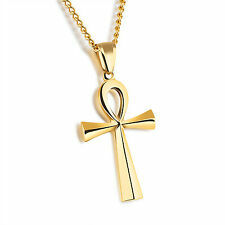 Ankh Egyptian Goddess Gold Necklace. Here is a unique Ouroboros Auryn Antique Gold Tone Double Snakes with Ankh Pendant. Historically, serpents and snakes represent fertility or a creative life force. As snakes shed their skin, they are symbols of rebirth, transformation, immortality, and healing. 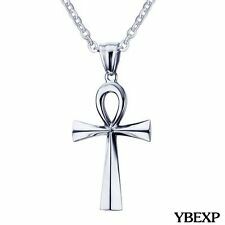 Style: Ankh Cross Pendant. Pendant Size: 4.25" x 1.8". Color: Gold. clear and correct.